BATMAN #69 seems to answer (at least for now) one of the core questions behind Tom King's run. While some of the story gets pushed into exposition towards the end, the issue is strong overall, getting readers back on track from a narrative perspective. Bruce finally discovers how he can break free of the nightmares, and also deduces the culprits responsible in Batman #69. The key is to uncover his greatest fear: the answer to a question he was too afraid to ask. 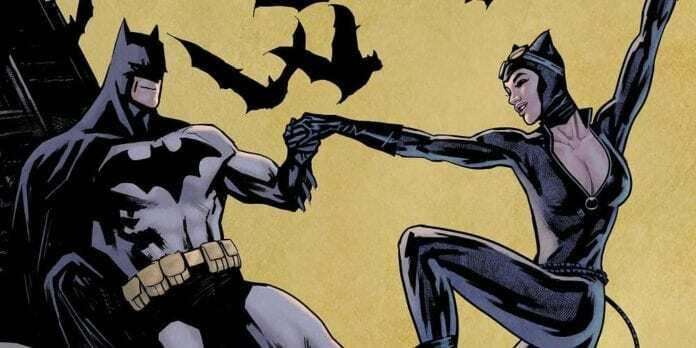 In terms of broader theme, a discussion of whether or not Batman should—or even can—have a happy life is central to the discourse surrounding Tom King’s run. Without offering spoilers, suffice to say Batman #69 comes down on one side of that debate in very certain terms. This could prove to be a polarizing issue as a result. Readers’ reactions to that conclusion will depend on which side of the question one lands on. Looking solely at the writing, though, Batman #69 is refreshingly purposeful. Coming off a few weak recent issues, this book seems intent to make up for it, pushing the narrative forward with intent. That said, some of the story ends up condensed into exposition, delivered via dialogue toward the issue’s end. Not ideal, but not a deal-breaker. Batman #69 splits its time between Batman trying to break free, and the culprits behind his torture. While it’s no surprise that Bane has a hand in the plot, the individual working alongside him comes as a surprise. It’s an interesting twist based on a plot point seeded dozens of issues ago. It’s too soon to say with confidence how it will pan out in the story, though. Yanick Paquette provides solid artwork for this issue. He divides the book in an interesting manner; many of the panels featuring Bane are tightly-cropped, stark, and gridded. 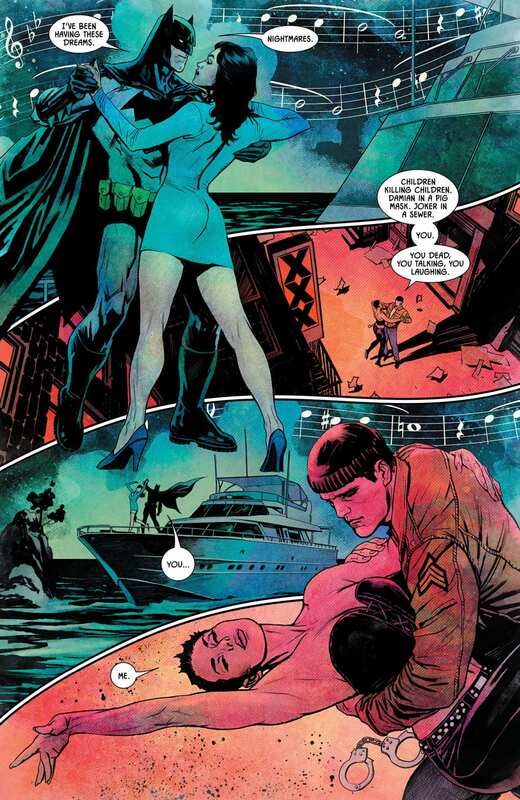 In contrast, pages following Bruce and Selina are much more free-flowing, often opening into two-page spreads. You feel the sentiment behind the latter, and the cold ruthlessness and rage behind the former. One complaint about Batman #69 is the facial expressions, which can sometimes look a bit lifeless and static. In one panel, you can clearly feel Bane’s rage; in another, he feels flat. The same goes for Selina, who looks a little dead-eyed from time to time. Overall, though, there’s a lot more here that works than that doesn’t. Nathan Fairbairn’s work on colors complements Paquette’s inks nicely. The wide palette of unnatural colors employed throughout gives everything a stylish look and highlights the dreamlike qualities. Batman #69 bounces back from a few weak prior chapters, delivering a stronger close to the Knightmares storyline. This issue will divide fans, perhaps even more than the wedding itself. That said, the book is well-executed, and gets us back on narrative track. David DeCorte covers comic book, entertainment, pop culture, and business news for multiple outlets. He is also a sci-fi writer, and is currently working on his first full-length book. Originally from San Diego, he now lives in Tampa.